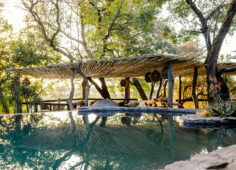 Discover the incredible Singita Boulders Lodge on the banks of the Sand River, built into the rocky hillside to blend in with the natural environment. Watch the Big Five move between the Kruger and Sabi Sands Game Reserve on 4×4 safari trips through this 18 000 ha wilderness. An oasis in the bush where rustic furnishings have been created from fossilised tree stumps and where slabs of solid stone, wrought iron and leather are balanced with the soft, sensuality of sheepskin rugs and natural flax bed linen. Singita Boulders Lodge is found on the boulder-strewn banks of the Sand River within the Sabi Sand Reserve. With its glass walls and open-air spaces the lodge provides a continuous connection with the prolific wildlife and birdlife for which Sabi Sand is so well known. Each suite has an ensuite bedroom, private sitting room and game viewing deck with private plunge pool overlooking the untouched wilderness. Rustic, handmade furnishings made from fossilised tree stumps, slabs of solid stone, wrought iron and leather are balanced with the soft, sensual feeling of sheepskin rugs and natural flax bed linen. Lodge facilities include a spa, a gym, a swimming pool and The Singita Boutique & Gallery and Premier Wine Boutique. 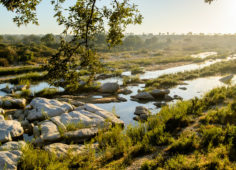 On the banks of the Sand River, built into the rocky hillside, Singita Boulders Lodge blends in with the environment, making as little impact as possible but making tourists feel extra special when they come to enjoy the game. Situated close to Kruger National Park, this private game reserve boasts a higher bio-mass of animals than Kruger and shares its western border – watch the Big Five move between the two reserves on 4x4 safari trips through the 18 000 hectare Sabi Sand Game Reserve. 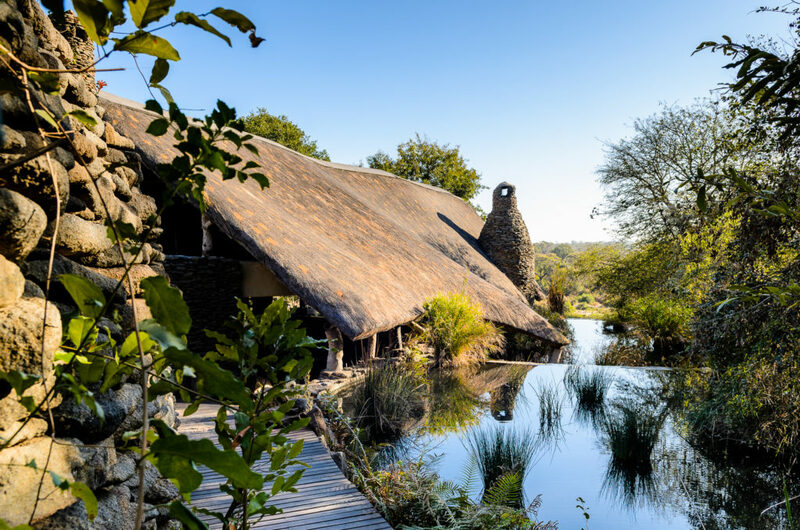 The lodge has been cleverly built to incorporate plenty of light, space, peace and natural flow, as in the natural South African environment outside. Here is an oasis in the wilderness where nature’s raw beauty has been transformed into an art –guests peer through walls of glass to see animals in their natural habitat. Exclusive accommodation in 12 double suites offers en-suite bathrooms with outside showers to boot, double- sided fire places, air-conditioning, swimming pools and decks on which to relax all day in the sun. 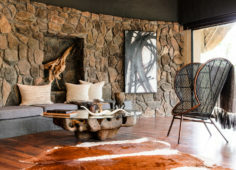 Singita Boulders Lodge offers every guest something grand, something earthy and something arty. The bush setting here in South Africa is perfect and dedicated staff make sure every guest is happy. Think first class service, food and wine and then think, contentment! Look out over incredible grasslands to see the lion, the cheetah and the elephant – nature’s grand creatures – from a place of comfort and luxury. One of the best experiences at Singita Boulders Lodge in Sabi Sand Game Reserve are the daily game drives where local trackers find Africa’s incredible wild animals. Bush walks take guests close to wild animals, tracking their spoor on foot and finding time to appreciate the landscape surrounding one. Adventure, Big 5, Birding, Flora, Gourmet, Indigenous Culture / Art, Leisure, Nature, Relaxation, Star Gazing, Wildlife, Wine, And more.